The Fisher-Price Roaring Rainforest Jumperoo is a jungle of fun and adventure! With 12 rainforest toys and activities for your little one to explore and an adorable smiling tiger seat, this interactive jumperoo is sure to have baby smiling and giggling as they bounce! 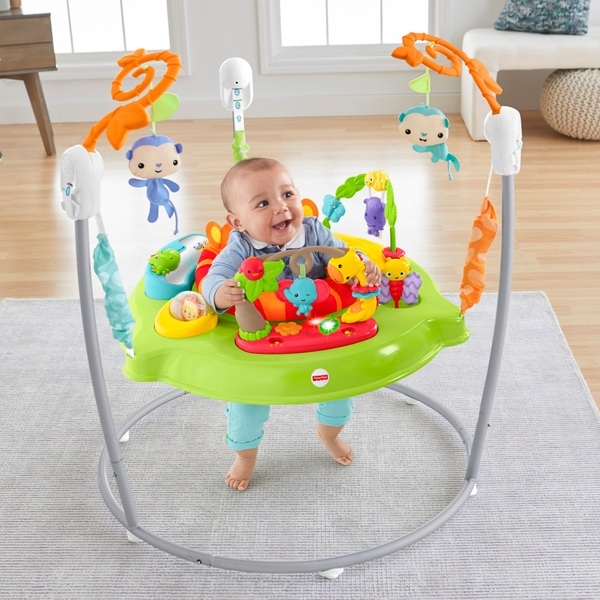 The seat of this clever jumperoo can twist a full 360°, allowing your baby to explore all the toys the Fisher-Price Roaring Rainforest Jumperoo has to offer. Jump and turn to bat at the smiling blue monkeys, click the alligator and teethe on the butterfly! Music, lights, beads and spinners encourage your little one to move, jump, grasp and reach, helping them develop their fine motor skills, colour recognition and growing understanding of cause and effect. The Fisher-Price Roaring Rainforest Jumperoo is suitable from when baby can hold their head up unaided and adjusts to 3 different heights as you little one grows. The sturdy, free-standing steel frame is engineered for stability, allowing tots to jump safely–no dooray needed! This playful jumper has soft spring covers to keep little fingers safe. The soft tiger seat pad is machine washable and dryer safe, keeping this jumperoo fresh as a daisy. EU Warning: Suitable from when Baby can sit up unaided. Never leave child unattended. Assist the child over thresholds or carpeting.